Arkansas Governor Asa Hutchinson signed a tax cut into effect at the beginning of February, known formally as the “Middle Class Tax Relief Act of 2015” (Senate Bill 6). While the bill grants savings to taxpayers (an estimated $22.9 million in FY 2016 and $90.3 million in FY 2017), it does so in a rather complicated matter. SB 6 contained three changes: first, a taxpayer’s tax rate schedule is now dependent on income level; two, it created a tax liability adjustment for certain taxpayers so that the new tax rate schedules wouldn’t create a “tax cliff;” and three, it changed an existing capital gains exemption. We’ll briefly discuss each of these. Retained the one-tenth of a percentage point tax cuts for taxpayers with annual incomes lower than $21,000. Suspended most of the one-tenth of a percentage point tax cuts for taxpayers earning between $21,000 and $75,000 for the 2015 tax year. Except for the bottom bracket (which remained at 0.9 percent), rates reverted to their former levels. For tax years 2016 and thereafter, rates were reduced for the two top tax brackets (from 7.0 to 6.0 percent and from 6.0 to 5.0 percent, respectively). Suspended most of the one-tenth of a percentage point tax cuts for taxpayers earning over $75,000 for the 2015 tax year (again, except for the bottom bracket). For tax years 2016 and after, rates were reduced only for the top tax bracket (a reduction from 7.0 to 6.9 percent). 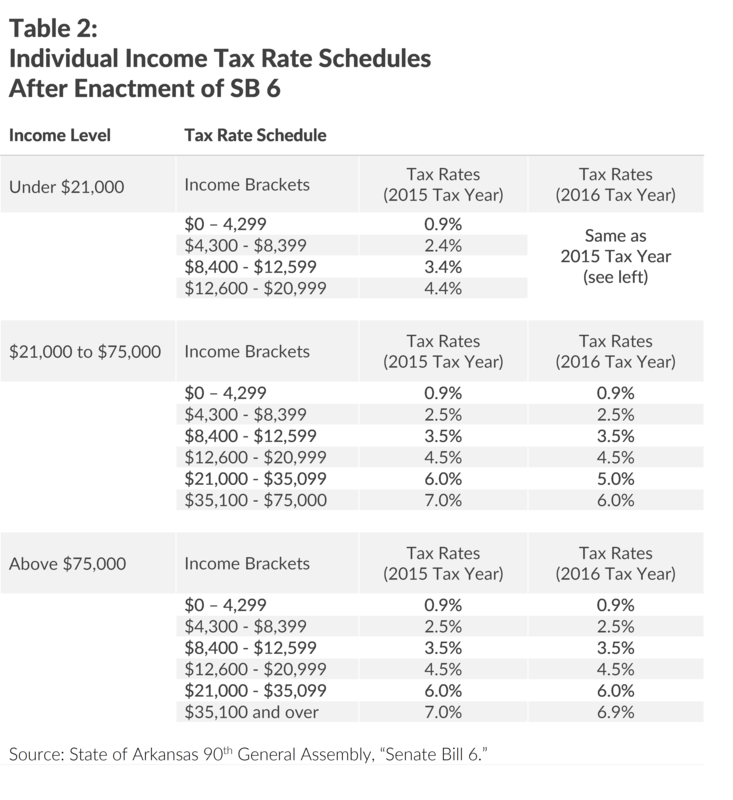 Senate Bill 6 also created a tax liability adjustment for taxpayers that fall in the “above $75,000” income level. This was meant to phase the highest tax rates in to eliminate a “tax cliff” where suddenly income is subject to a much higher tax rate when one additional dollar is earned. The adjustment is available to taxpayers earning between $75,000 and $80,000 and ranges from $440 to $40. The adjustment amount decreases as income increases. Finally, SB 6 also changed the amount of realized capital gains that can be exempted from state income tax. Formerly, gains in excess of $10 million in tax years 2014 and after were exempted from Arkansas state income tax; an exclusion of 30 percent of gains realized in tax years 2015 and after also existed. Now, the exemption for capital gains greater than $10 million realized in tax year 2014 and after has been repealed. Further, the 30 percent exclusion (for tax years 2015) was altered as follows: now 50 percent of capital gains realized during January 2015 are excluded and 40 percent of capital gains realized on February 1, 2015 and after are excluded. More on Arkansas here. Follow Liz on Twitter @elizabeth_malm.